One of the biggest concern for vapers in the 21st century, aside from ease of use, is portability. It is one thing to have a device that is capable of an outstanding range of wattage output, it is another to have one that you can carry about with you wherever you go. These days, on-the-go vaping has become a priority. The Suorin iShare Portable System Starter Kit also known at the Suorin Twin AIO Kit has easily become a solution to this seeming problem. It is an extremely portable pod system that comes with an additional game-changing feature- a viable option for vaping salt based nicotine. 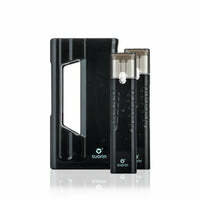 It is powered by a built-in battery, holds up to 0.9 milliliters of juice and is capable of 9W at its maximum output. The Suorin iShare kit is the perfect choice for vapers who want the combination of portability, power, and a beautiful design. Suorin iShare Ultra (Twin AIO) Portable System Starter Kit - Suorin has a rating of 3.5 stars based on 11 reviews.